In 1938-39, Verdun was still in the midst of the Great Depression, with a large number of its residents hired as city “relief” workers for various municipal projects. The Natatorium idea would provide another opportunity for work and would showcase the ingenuity of our city planners. Some of whom are still named on a plaque at the pool’s entrance. Yet not all names would be remembered. On June 14th, 1940, a month before opening, Verdun’s city council reversed its decision to award Mr. Minicucci, of Italian descent, the right to lease the restaurant atop the new Natatorium. Stating that, “the entry of Italy into the war on the side of the Nazis caused the change”. On June 28th, 1940, without any further reasoning, the council awarded the space to Mr. W. Gunhouse under the same terms. In these times, the actions of a foreign country to ally with the Nazis gave us the name “Gunny’s” for the rooftop restaurant, after its new owner. While the Minicucci name sadly became an indirect casualty of war. 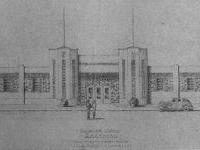 It was opening night, Friday, July 12th, 1940, 7:00pm, as crowds of people excitedly rushed across Bannantyne Avenue and LaSalle Boulevard eager to see the Natatorium open its doors for the first time. With lights shining on its double castle-like front turrets and union-jacks waving above them, the building took on an amusement park feel, like at the gates of Belmont Park. More than 2,000 spectators paid the 50-cent admission (25-cents for children) and filled the pool area, gathering tightly on the roof. The scene was almost surreal against the night sky, as the smell of fresh paint still lingered in the air. The two pools were illuminated by 22 underwater “submarine” lights, allowing a clear view of their bottom floors. The lamp posts overhead and atop the pool-house lit up the deck areas, which surrounded each pool with 30 feet of non-skid concrete laid in contrasting shades. The two “island fountains” of the larger pool had coloured lights below them and jetted water into the air through their extended spouts, as the deeper pool looked more official with its 5 Olympic-regulation sized diving boards. The brick posts of our 3-mile boardwalk dotted the riverfront, as a reminder of where we all had swam before. These early moments would not last, as the Verdun Natatorium was about to be launched into history, as host of the 1940 Dominion Swimming and Diving Championships! The Verdun Natatorium. At 8 o’clock, the MP for Verdun, Mr. Leo-J. Comeau, officially inaugurated the new Verdun Natatorium and opened the championship, earning wild applause from the crowds. Within the fanfare, our Mayor, Edward Wilson, Chief Engineer, Henry Hadley, and many of our city councillors stood alongside, proudly smiling at their achievement. They had not only put Verdun on the local stage, but by inviting swimmers from the “Atlantic to the Pacific”, they had put our town in the spotlight across the Dominion of Canada. The competitions were planned that way, with events held exclusively for Verdun residents amidst the national trials. For those few days, news of the winners headlined across the country, with the Natatorium front and center, quickly gaining its reputation as “the finest pool in Canada”. Our city councillors ensured that the Natatorium would keep us financially safe as well. By first floating a loan for $200,000, they decided to keep admission prices as low as possible, just enough to cover operating costs and to keep paying back the loan. As annual attendance grew, the pool paid back $9,500 each year from 1941 to 1945, about $11,000 each year from 1946 to 1951, and was on target to return a profit by 1961. Planned within the hardest of economic times, the Natatorium never lost money. To this day, it remains a true example of responsible public-spending. Before the Natatorium, many Verdun residents fell ill from swimming in the increasingly contaminated St.Lawrence waters. The new pool was clearly designed with public safety in mind. Its three large automatically-controlled pressure filters could produce 1,250 chlorinated gallons per minute, when required. The main building housed a first-aid room, a “tote-box” room for your belongings, and the men’s and women’s dressing rooms each with 16 hot-water showers. A shower and a foot bath were mandatory before entering the pool. “Gunny’s” restaurant would provide a hot snack-bar menu to hungry swimmers on the ground floor and on the roof. Verdun policeman were stationed at the pool as lifeguards, security guards, and as swimming instructors to the public. With numerous ladders within the pools and elevated lifeguard chairs around them, the Natatorium gave us a safer way to cool off in the humid days, before central air. A year later, in early June 1941, people were turned away from their morning swim and curiously began gathering at the pool’s outer fence, as patrolmen walked the interior. All went silent, as a lone silhouette exited the men’s dressing room and headed for the diving pool. The well-muscled man dropped his towel, climbed the steps, and walked into the sunlight at the tip of the 3m high board. Onlookers burst out in excitement when realizing that they were in the presence of Tarzan himself, as Hollywood star, Buster Crabbe completed his first dive into our Natatorium’s history. The spectators cheered after every dive, as Buster waved back to them. He was practicing as a star of the 1941 Water Follies, being held over the next four nights (June 5 -8) at the Montreal Forum. Many felt fortunate to get his autograph that day as Buster “Tarzan” Crabbe, even though Jiggs (Cheeta) was no longer at his side. He would visit the Natatorium many times in the following years, not only to practice, but to sell Victory Bonds in support of Canada’s war effort. Buster Crabbe was twice a US Olympic swimming champion, winning bronze for his 1,500m freestyle at the 1928 Amsterdam games, and gold for his quick 400m freestyle at the 1932 Los Angeles games. 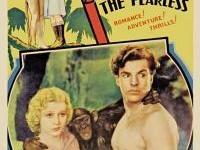 His lead role in the 1933 “Tarzan the Fearless” series successfully launched his acting career and allowed him to star in over one hundred films, including his famous Flash Gordon series of 1936. Poster, Tarzan the Fearless, 1933.In 1941, he decided to entertain us off-screen as well, by showing us his amazing swimming skills, as the main attraction of the travelling “Water Follies” show, which required a temporary natatorium to be built at each of its 34-city stops. Montreal Forum staff would work for 48-hours straight, to install a 325-ton pool structure that would hold 80,000 gallons of water, for the performances of over 100 aquatic stars. The events included thrilling feats of diving and speed, from our own Buster Crabbe, Betty Wilson, NYC’s best swimmer, and famous trick-diver, Joe Peterson of Panama. The comedy acts included Charlie Diehl, the “235-pound marvel of the springboard”, with Clayton Mains and Frank Foster, as some of the many “funny men in bathing suits”. The “Aquabelles”, 20 synchronized mermaids, highlighted each show with their intricate water ballets, beautifully set to orchestrated music. The Forum was decorated like a Miami Beach club, with palm trees, tropical flowers, and eel grass waving throughout. After the shows, “The Coquettes”, an all-girl band, would open the new 3,600-foot dance floor to the audience, to swing the rest of the night away. We can only imagine the beauty and excitement of these shows, with our Tarzan of ’33 diving at center ring. Today, Gunny’s lights continue to glow above pool-house, with the upper-deck now closed to the public. The “submarine” lights and the fountain lamps remain dark in their receptacles below the waterline, awaiting an opportunity to shine again. The pedestal lines of the diving boards have long been painted over, hiding the echoes of championships past. The Natatorium once invited swimmers to swim into the night, at times closing at 10pm or later. As we stand by the pools at today’s 8pm closing time, we can still revisit those magical nights by simply closing our eyes and smiling in remembrance, of what was once the finest pool in Canada. After 71 years, our Natatorium is still a cool place to swim on a hot summer’s day. Although, many of us are unaware of its former glory and of the great civic pride we all once held for this wonderful place. No longer hosting national competitions nor welcoming celebrities to its doors, the Natatorium endures as a testament to our early city planners. Sitting quietly at the riverfront awaiting the next perfect day, it has become a proud part of our Verdun identity and heritage. Remembering a time, when a true-to-life Tarzan and his world-famous chimp, had swung their way off the silver screen to make a splash within the deepest pools of our Southwest Corner.